When 100 starving sea birds landed on beaches from Monterey to Marin this summer, it was a crisis for the International Bird Rescue Center in Fairfield and a possible warning that something was going wrong in their environment. On Tuesday morning, 20 of the rehabilitated birds that survived were released out of Half Moon Bay. Four cages were loaded onto a 53-foot charter boat at Pillar Point Harbor. Skipper Dennis Baxter volunteered to take the 20 murres out to where murres are feeding. The young birds spent the past five weeks being fed and cared for here at the rescue center. A great majority of the starving murres didn’t make it. Senior rehab technician Jennifer Linander said the number of survivors is normal. "A lot of it is the condition that they come in," Linander said. "We have to stabilize them, which is where we lose a lot of them. If they’re too emaciated, too cold, they just can’t make it through the stabilization process." The center’s director, who feared a much larger die-off, told NBC Bay Area it never materialized. "Fortunately, this seems to be a one off," J.D. Bergeron said. "It may be that this year, there were so many more murre chicks that the number of babies on the beach was what one would expect." It hasn't been determined if this set of 100 murres was a complete natural situation. There remains record-breaking water temperatures, a big die-off of murres in the Arctic and a relative shortage of the bird’s preferred fish. 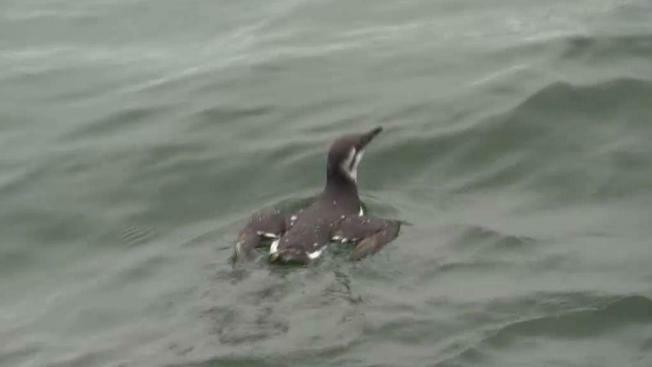 But Tuesday was a win for the murres and for the staff at the International Bird Rescue Center. "Somewhere out there, a bird we’ve been talking about and all of us have sort of been rooting for quietly, she’s now a wild bird again and hopefully goes on to live a wild bird life," Bergeron said as he watched the release. "This is my favorite part."